MRB wrote: he doesn´t have to make pop album, he can make regular album that is blues album. blues project doesn´t have to be always boxset. Yes, of course, and The Blue Jukebox is a perfect example of that, one of my favourite CR albums, really balanced in everything, including cover arts and promotion. But Chris often seems to intend to be pretty extreme in his working approach. Take rebellious RTHII or laid-back KotB and, on the contrary, The Blue Guitars or The Delmonts. They are all too far from being reasonably balanced, in my opinion. And thanks Ann for mentioning the crew, really names from nowhere, never heard of them. Strange that Chris does not call up his old buddies Paul Lilly or Neil Amor. You can find Scott McBurney on the movies from Santo Spirito, but making a movie and being a manager sounds like a different job to me. I like his Blue Jukebox, Delmonts and even the Jazzee albums on his own label, those made for and with his band members. the forum seemed dead for a long, long time and when openend the page after a while I was pretty astonished to see this thread Thanks for this interesting topic! Many times in the "good old" past the magic of Chris' songs really showed not only because of his songwriting skills but also due to his excellent band and studio musicians who really contributed to the sound. And of course because of a great producer like Jon Kelly who was able to make a clean and professional sounding album - that still sounds organic. Auberge is a great example - for me the showcase of tasteful arrangements and production. Personally, I think the overall sound of the production is a very important part in the process of making an album. There have been some cheesy sounding tracks in the 80's - sometimes due to the recording techniques used, sometimes just because of the taste then (I think most 80's productions haven't aged well). But nowadays you have the opportunity to record an album on your own at a home studio and get a decent result with a lot less effort and money than back in the days - so there's no excuses in my point of view why Chris did such a bad job with the last albums. I'm still dreaming of a new album with only 10 tracks - but all of them high quality. Recorded with a real band. Mixed and produced by a professional. A keyboard player like Max Middleton or Kevin Leach can give the songs class - and I was very impressed by Anthony Drennan's guitar skills during the last tours, as well. Listened carefully today to Santo Spirito soundtrack (CD3, the short one) with a CD player and high-end earphones. Take my previous words back: Jon Kelly really made the sound good and it reminds me a lot of CR late 90s records with heavy use of drum machines and electronics but great sound quality. So no complaints on engineering, in comparison to 2005-08 albums which sound mostly like a teenager's home-made demo. But while listening, I cannot stop thinking that all the sounds but guitars are synthetic - drums, strings, brass, even guitars sometimes are deeply sampled! What was okay in 1999, sounds so weird after Chris used dozens of rare instruments on his blues roots projects in early 2000s. The heavy drums and synths that sound organic in songs like Can't Get Through, seem to be so out of place with flamenco guitar, as if a crazy DJ did the mixing. Someone please rob Chris's studio and leave him off all his samplers and synths! Leave him alone with his guitars and mikes! New Tour and Album, even Russia, are you going? ann268 wrote: Hi Andrey, New Tour and Album, even Russia, are you going? Hi Ann, most likely I am, but the more I hope to get a business meeting with CR management when he comes to Russia. I wish to talk on my old stuff reissues project and social networks support. Last edited by andrew fischer on 27 Apr 2017, 08:11, edited 1 time in total. Keep me posted, sounds wonderful! 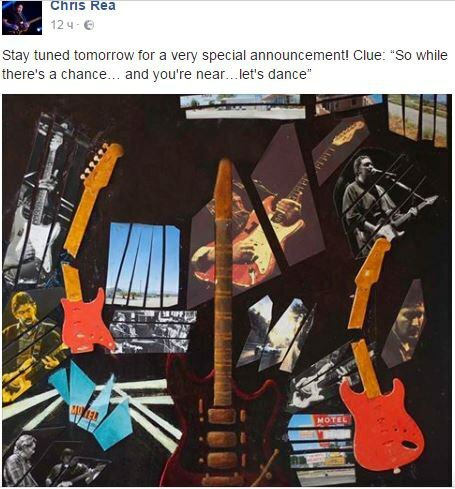 This new Tour is about Love Songs, very curious what it is going to be. The photo might suggest something acousic, the one he placed on his site. ann268 wrote: Keep me posted, sounds wonderful! This new Tour is about Love Songs, very curious what it is going to be. The photo might suggest something acousic, the one he placed on his site. though the new guitar in the poster is totally unfamiliar to me, it doesn't look like an acoustic/semi-acoustic. I think it's electric one Chris bought to use with a metal slide as opposed to the glass ones he normally uses. About the tour setlist, I think BMG, his new label, won't let him sing too little new songs and too much same old blues stuff he is playing for years now. I expect it to be close to the structure of The Farewell Tour - 1/3 new material, 1/3 same old stuff (both blues and hits) and 1/3 additional old songs (I really do hope for that). Press-release at http://www.chrisrea.com/about/ says about saxophone on one of the songs, I wonder which musicians will be used on tour, as I hope for someone special like accordeonist Gerry O'Connor in 2001-03 or sax player Eric Seva in 2004. I know many do not like it but almost sure the back vocals by Island Sky will be on this tour as well. The other band members may be whoever, though, of course I hope Max Middleton will join again and do much more work on stage than he did on 2012 tour. I'm really excited to read that this album has been recorded with a "real" band in a renowned studio - one of my main points of criticism over the last years. Hopefully with a producer like Jon Kelly and a few good arrangements instead of these generic sounds of the last years. I also hope his record company doesn't make him smoothen his sound too much... a good combination like on RTH or Auberge would be fine. After the last tour I promised myself I would not go to a Chris Rea concert again - after so many nearly identical setlists since 2006 - but yesterday I bought a ticket for Berlin and I'm really looking forward to this tour. Hopefully he will play a few gems from the past - like he did with "It's All Gone" in 2012. Last edited by tobi777 on 27 Apr 2017, 12:20, edited 1 time in total. Well, I got this info yet back in January but 'signed' for non-disclosure until pullic announcement. At first, I did not believe that much as well. But the info proved to be right. tobi777 wrote: I'm really excited to read that this album has been recorded with a "real" band in a renowned studio - one of my main points of criticism over the last years. Hopefully with a producer like Jon Kelly and a few good arrangements instead of these generic sounds of the last years. I have been trying to approach Jon Kelly through other CR-related people to find out what he is after right now but no luck so far. I was lucky to have a short talk to Jim Beach and he said he was going to talk to Chris on his old stuff reissues but had no chance so far, must have been busy with Queen Productions. tobi777 wrote: I also hope his record company doesn't make him smoothen his sound too much... a good combination like on RTH or Auberge would be fine. Yes, this what I sincerely hope for as well. Though I don't consider TRTH album a 'good combination' as it appears to be neither a fully conceptual album, nor such a successful producer's effort as Auberge. My fear is that the new album may sound too much like the old stuff, that Chris will be 'citing' his own music again. tobi777 wrote: After the last tour I promised myself I would not go to a Chris Rea concert again - after so many nearly identical setlists since 2006 - but yesterday I bought a ticket for Berlin and I'm really looking forward to this tour. Hopefully he will play a few gems from the past - like he did with "It's All GonE2 in 2012. Yes, me too, quite identically. Really intrugued and inspired, after long years. My thoughts on the setlist I have already put above. I can remember a few years ago Chris said in an interview that he planned another concept album / earbook about different kind of roads you travel on and journeys. Maybe these ideas led to this new album. Does anyone know if it will be a standard CD like in the old days or any posh edition like the last releases? Have you read they recorded this album in a real Studio Tobi, on his new website, in the header about..
ann268 wrote: Have you read they recorded this album in a real Studio Tobi, on his new website, in the header about..
My question was more about the presentation / format of the album - will it be a standard CD or an earbook. Chris said that nowadays you won't have success releasing just a CD but you have to give more (like a book and so on) to keep the people from downloading the tracks from illegal sources. I'm interested to know if Chris still has the power to enforce this opinion or if the record company won't take any risks. Anyway, I'm looking forward to this album (no matter what physical format) and really hope the overall quality will be improved compared to Santo Spirito and other records of the last years.